Lindsay is an associate professor at the University of Miami School of Communication and Knight Chair of Interactive Media. He is Vice President for the Global Game Jam™ and Vice President of the Higher Education Video Game Alliance. 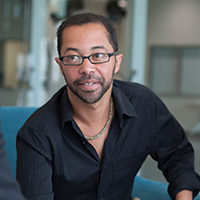 His is work has received awards and recognition from the Games for Change Festival, the Digital Diversity Network, the Association of Computing Machinery's digital arts community, Black Enterprise and others. He has published more than 50 papers, articles and book chapters on games since 2009. His creative work has been selected for showcase internationally including New York, Paris, Sao Paolo, Singapore, Chicago, Vancouver, Istanbul, and others. He has given talks at the Game Developers Conference, SXSW, Games for Change Festival, the Online News Association, the Society for News Design, and many other industry events. Between 2013 and 2018 he was the founding director of the American University Game Lab and Studio. From 2009 to 2013 he was the Armstrong Professor at Miami University’s School of Art. Lindsay also served on the board for the Digital Games Research Association (DiGRA) between 2013-2015.